The famous Kling Pool Table was first built in 1907 by Brunswick Billiards and became the world standard for how a table should look and play. This exact replica of the original Kling by Golden West of Oregon not only looks as good as the original it features modern construction for more perfect play. The Kling is Constructed on massive 14” hand carved bell shaped elephant style legs. 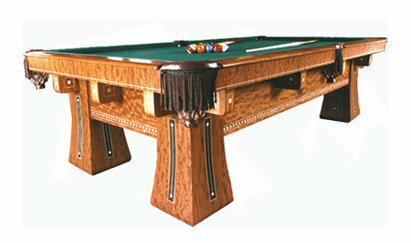 The 2” X 12” frame and solid hardwood blocks makes this jumbo fame the Ultimate in pool table perfection. Mother of pearl and ebony inlays enhance and enrich this time honored classic. Built to order in the USA you can customize the finish, inlay, size, even build the Kling in 10' size for snooker or carom.